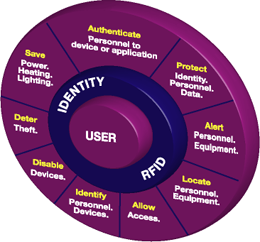 SecuriCode Ltd is a UK-based developer, manufacturer, supplier and installer of Active RFID solutions including applications used to record, audit, track, locate, authenticate (identify and allow / deny access), search for people and products and monitor sensors in real-time. We have deployments in twenty-two countries with a mix of transport, healthcare, hygiene, logistics, retailing, security, leisure, transport and education end users. SecuriCode provides installation and support services either directly or via international sales channels (some healthcare channels re-brand SecuriCode products as their own). Solutions operate in the 2.4GHz band at very low power using interference-reducing methods making them suitable for any country and any vertical without license or safety concerns. Two adjustable ranges are available (up to 10metres typically used for people location and access and up to 250metres typically used for large warehouses, building sites etc). Nodes (intelligent readers) and Tags are price competitive, feature-rich, orientation and material-independent, small and lightweight and unobtrusive. Nodes are available in multiple connectivity options (Ethernet (and PoE), WiFi, USB, Compact Flash, RS232, TTL, Wiegand, PowerLine, GPRS, Long range radio) and some include application-driven relays and input/output for access control and alerting. Tags (with globally unique identities) are long battery life and include movement detection, battery monitoring, encryption, authentication (with Nodes), anti-collision and an automatic expiry option. Tag timing is configured by SecuriCode to suit the end-use. Some Tags incorporate monitored inputs (for sensors), user alerts and tamper alerts. Tags are also available to replace swipe-card systems and always-on Tags are available for assets that are mostly stationary. The Atlas RFID Server includes browser-based applications (asset definition, site plans, real-time location, access control, time and attendance, alerting). Lowest power consumption and fastest transmission (longest battery life). Lowest transmit power (suitable and safe for all verticals). Most universal frequency (suitable for all countries). Least likely to be affected by other products (reliable and accurate). Most adaptable (multiple network types and support for alerts and sensors). Most comprehensive (including multiple-function applications). Most secure (prevents information being eavesdropped). Please contact us for the SecuriCode Operational Overview, Whitepapers, Pricing (which is product type and quantity dependent) or industry-specific marketing information.